Martin Stanley Frank was born in Montclair, N.J., July 11, 1941, He died in Texas on April 2, 2008. 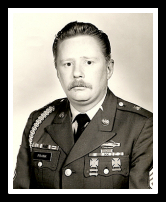 His US Army home of record is Belleville, N.J.
Frank enlisted in the Army on April 5, 1966. He served in Company B, 1st Battalion 12th Infantry, 4th Infantry Division Camp. Sgt. Frank was an infantryman who was captured with several other soldiers on July 12, 1967, in South Vietnam. He spent 2,063 days as a prisoner before he was released in 1973. Among his decorations and medals are a Silver Star, Bronze Star, Purple Heart and Legion of Merit. He was discharged from the Army as a Master Sergeant on April 13, 1987. I was born in Montclair, New Jersey and was raised in Belleville, New Jersey. l entered the Army in April of 1966 shortly after a separation from my wife. I attended Basic Training at Ft. Dix, New Jersey and at Ft. Polk, Louisiana. In September of 1966 I left for Vietnam and was assigned to Company B, 1st Battalion, 12th Infantry, 4th Division. My station camp, Camp Eneri, Pleiku, RSVN. I was captured at Pleiku Province July 12, 1967. My first two and a half years were spent in the jungle prison camp in South Vietnam. We walked to North Vietnam. At one time I was down to 95 pounds and at the time of my release I was back up to 130 pounds. After returning to US control 5 March 1973, I had a preliminary examination at Clark Air Force Base, Philippines and then was sent to Ft. Monmouth, New Jersey for further examination. I am presently assigned to Ft. Monmouth as a career counselor. I just re-enlisted for four more years as I intend to make a career of the service. Martin Frank married Betty M. Henderson, in Bexar, Texas, on October 12, 1979. 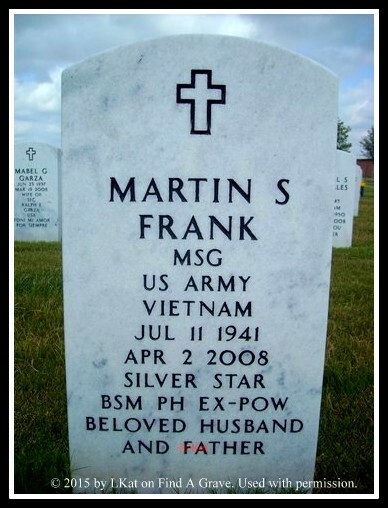 Martin S. Frank, 66, died at the Audie Murphy VA Hospital in San Antonio, April 3, 2008. He is survived by his wife Betty Frank; children Virginia Johnson of Shreveport, La., Deborah Krester of Pittsburgh, Joseph Frank of Albuquerque, and Shannon Frank of Lynn Haven, Fla.; two brothers, George Frank and Joseph Frank; and 11 grandchildren. Frank is buried at Fort Sam Houston National Cemetery, San Antonio, Bexar County, Texas. SYNOPSIS: On 12 July 1967; Sgt. Cordine McMurray, then Sgt. Martin S. Frank, SP4 James L. Van Bendegom; SP4 James F. Schiele, SP4 Nathan B. Henry, SP4 Stanley A. Newell, and SP4 Richard R. Perricone were riflemen assigned to a search and destroy patrol operating in the Ia Drang Valley, Pleiku Province, South Vietnam. The area in which the patrol was operating was covered in jungle with scattered grass covered clearings approximately 4 miles east of the South Vietnamese/Cambodian border, 6 miles south of QL19, the primary east/west road in this region, 10 miles south-southwest of Duc Co and 68 miles from the tri-border region where South Vietnam, Laos and Cambodia meet. In the early morning hours, the company came in contact with a VC force of unknown size. In the ensuing battle, several members were wounded, including Sgt. McMurray, SP4 Van Bendegom and SP4 Schiele. In the case of James Schiele, other members of the patrol saw him hit several times in the legs and chest by automatic weapons fire. The medic treated their wounds before moving on to treat others. Shortly thereafter the American position was overrun. As some members of the patrol successfully evaded, the VC captured Sgt. McMurray, Sgt. Frank, SP4 Van Bendegom, SP4 Henry, SP4 Newell and SP4 Perricone. They also captured SP4 Schiele who reportedly died of his wounds just before or shortly after capture. James Van Bendegom and Cordine McMurray were taken to the V211 Front Field Hospital where their wounds were treated. A week later, Sgt. McMurray joined the other four Americans in the B-3 Front Camp. He reported to the others that when he last saw James Van Bendegom before leaving the field hospital, SP4 Van Bendegom was alive. While still being incarcerated in the B-3 camp, the camp commander told the others captured with SP4 Schiele and SP4 Van Bendegom that "James Van Bendegom died about two weeks after entering the hospital" and "James Schiele was buried near the battlefield." The V211 Hospital and B-3 Front POW Camp compound were described in the following manner: The camp and hospital were a complex of buildings in several separate locations, all within close proximity of each other inside the territorial boundary of Cambodia. The camp's graveyard was associated with the hospital. The hospital itself was located just inside the treeline on the north side of the Tonle San River and the Stoeng Ta Pok tributary bordered the hospital on the east side of it. Sgt. McMurray, Sgt. Frank, SP4 Henry, SP4 Newell and SP4 Perricone were moved to a POW camp they called "Camp 101," which was located just inside Cambodia in the tri-border area due west of the city of Kontum, South Vietnam. Two other POWs, PFC Joe L. Delong and WO1 David W. Sooter who were captured in the same general area months earlier, were eventually moved to a larger compound, Named "Camp102," located nearby that could house additional captives. In 6 November 1967, Stanley Newell, Cordine McMurray, Richard Perricone, David Sooter and Joe Delong attempted to escape from Camp 101 when PFC Delong clubbed a guard and took his rifle way from him. The POWs moved through to jungle in an east to southeasterly direction. Several hours after they escaped, other prisoners heard shots in the distance. Within a short period of time, all but Joe Delong were captured and returned to the prison camp. On 8 November, VC officers showed the prisoners clothing that was positively identified as belonging to Joe Delong. The VC told them that he was dead and if they tried to escape again, they would end up the same way. The pants had several bullet holes in them and were covered in blood. The other prisoners were never shown a body, and while some believed the officers' report that Joe Delong died while escaping, others did not. The men who escaped with Joe Delong believed he only got 2 to 3 kilometers away from the camp before the VC guards caught up with him. In November 1969, the surviving POWs were moved north up the Ho Chi Minh Trail by foot to North Vietnam. The two groups arrived in Hanoi in April 1970. In 1970 a VC rallier said he interrogated two Americans in the V211 Field Hospital, one of whom was black and the other was white. The black soldier has been identified as Cordine McMurray and James Van Bendegom was identified as the white American. The rallier said he heard the white American died in the hospital. He also heard that a third American who was captured at the same time who "committed suicide shortly after he was captured and was buried near the battlefield." US intelligence personnel correlated that hearsay information to James Schiele and included a copy of the report in his casualty file. Cordine McMurray, Nathan Henry, Stanley Newell, Martin Frank, Richard Perricone and David Sooter returned to US control on 5 March 1973 during Operation Homecoming. The six returnees provided their debriefers with detailed information about their capture, incarceration and missing comrades. In December 1990, a joint team under the auspices of the Joint Task Force for Full Accounting (JTFFA) traveled to Vietnam to investigate the case of James Schiele and James Van Bendegom. They interviewed several witnesses who provided firsthand information about the B-3 Front POW Camp and the V211 Field Hospital. The witnesses confirmed that these facilities treated/held US POWs and made records on them for higher authorities. In May 1994, US personnel were conducting research in a Cambodian military museum when they found a passage in a book titled "The People's Armed Forces of the Western Highlands," published in Vietnam in 1980, that pertains to this incident. The passage states, "On 12 July (67) … the soldiers of Battalion 7 wiped out 2 US companies, capturing alive six people in the area southwest of Duc Co."
Other JTFFA teams returned to Pleiku Province to continue investigating this loss incident. In February 1995, a joint team was able to find the probable location of the V211 hospital based on information obtained during interviews with former Khmer Rouge guerrillas who operated in the area. The Cambodian witnesses observed that it was much easier to reach the former base location using the approach through Cambodia rather than through Vietnam. There is no doubt that James Schiele died of wounds received in combat and that he was buried near the battle site. There is some doubt that James Van Bendegom actually died in captivity in the V211 Field Hospital because his name never appeared on the PRG's list of POWs who died in captivity. As for Joe Delong, his name was included on the PRG's Died in Captivity list as having died in November 1967. If these men are dead, each man has the right to have his remains returned to his family, friends and country. However, if the reports of his death were exaggerated, James Van Bendegom’s and Joe Delong’s fate, like that of other Americans who remain unaccounted for in Southeast Asia, could be quite different. Either way there is no doubt the Vietnamese know what happened and could return them or their remains any time they had the desire to do so. Soldiers in Vietnam were called upon to fight in many dangerous circumstances, and each was prepared to be wounded, killed or captured. It probably never occurred to them that they could be abandoned by the country they so proudly served. Source: Task Force Omega Inc.
Headstone, Fort Sam Houston National Cemetery - © 2015 by LKat on Find A Grave. Used with permission.